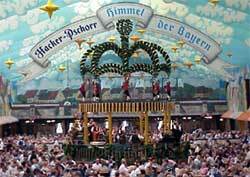 The annual Oktoberfest in Munich, Germany has been called "the world's largest beer party". It attracts some seven million people (including loads of travelers) a year during a 16 day period from late September to early October. People come to have fun with friends and family in the enormous beer tents. The revelers sit tightly at long communal tables to drink liter-size mugs of strong Bavarian beer and eat copious quantities of grilled chicken and pork sausages while a lederhosen-attired Bavarian brass oompah-pah band entertains on a stage raised above the crowd (see photo). Often, the rich and poor, the famous and obscure spontaneously lock arms and sway in comradeship while singing and toasting. It's a loud and noisy affair that's not to be missed. The hefty, ethnic-clad waitresses have become an essential part of the scene, especially when they barrel down the aisles carrying up to ten large overfilled beer steins at a time. If you're in their path, it's wise to step aside.